Prices for the construction of non-residential buildings increased more than prices for residential buildings in the fourth quarter, according to data from the Construction Contractors Survey. Increases in both residential and non-residential building construction costs were largely driven by the ongoing rise of steel and metal prices, which were affected by tariffs imposed in June 2018. According to the Industrial Product Price Index (IPPI), prices for primary ferrous metal products rose 14.9% from January to December 2018. Non-residential building construction costs increased 0.8% in the fourth quarter, following a 1.6% gain in the third quarter. Construction costs were up for all types of non-residential buildings in 10 of the 11 census metropolitan areas (CMAs) surveyed. The largest increases were in Ottawa (+1.2%) and Vancouver (+1.0%). In Canada, contractor prices for the construction of warehouses and factories (both up 1.0%) rose the most. These increases were attributable to the continued rise in prices for metal fabrication and of concrete products, which are important components in the construction of both building types. Based on the IPPI, the price of concrete products increased 3.9% from January to December 2018. Higher prices for structural steel framing also pushed up construction costs for factory buildings. Prices for the construction of non-residential buildings were up 4.6% over the 12-month period ending in the fourth quarter, led by higher construction costs in Ottawa (+6.7%), followed by Vancouver and Toronto (both up 5.7%). Construction costs for all types of residential buildings rose 0.4% in the fourth quarter, following a 0.9% increase in the previous quarter. The CMAs of Ottawa (+1.9%) and Vancouver (+0.9%) posted the largest increases, with builders reporting higher prices for metal fabrication products, structural steel framing, and concrete products as the reasons for higher construction costs. Toronto (-0.2%) posted the sole decrease in the fourth quarter, with construction costs declining for both single-detached homes (-0.3%) and townhouses (-0.2%). Builders cited declining prices for wood, plastic, and composite products as the reasons for the decrease. Prices charged by contractors for residential building construction were up 5.1% over the 12-month period ending in the fourth quarter. Construction costs rose the most in Winnipeg (+9.1%) and Ottawa (+7.0%). 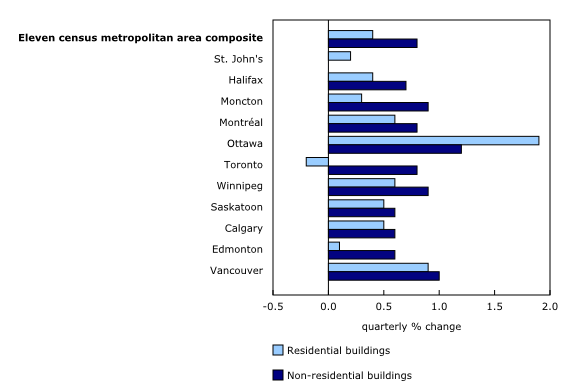 The building construction price indexes (BCPI) are quarterly series that measure change over time in the prices that contractors charge to construct a range of new commercial, institutional, industrial and residential buildings in 11 census metropolitan areas: St. John's, Halifax, Moncton, Montréal, Ottawa–Gatineau (Ontario part), Toronto, Winnipeg, Saskatoon, Calgary, Edmonton and Vancouver. These buildings include six non-residential structures: an office building; a warehouse; a shopping centre; a factory; a school; and a bus depot with maintenance and repair facilities. In addition, indexes are produced for five residential structures, including a bungalow, a two storey house, a townhouse, a high rise apartment building (five storeys or more) and a low rise apartment building (less than five storeys).